When choosing to grind a tank, the maneuverability is one of the major stats. 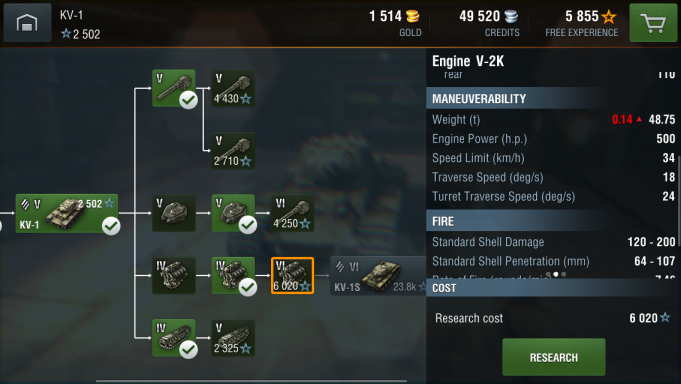 I did research and looked up how the game determines acceleration of a tank, HP/ton is not the only ratio WG used to assign acceleration values. To demonstrate i will be using the tier 10 mediums T62a, E50m, and M48 Patton. 3.Effective HP/ton: This is the effectiveness of horsepower on different ground and terrain, and the acceleration of a tank on flat ground. It is determined by the formula (HP/ton)/terrain resistance. The higher the value the better the acceleration. This is the reason why t62a, despite having the lowest HP/t of the tier 10 mediums, accelerates quickly and can reach 50 km/h faster than the e50m on flat ground. Edited by UnModernized, 19 August 2014 - 06:14 PM. I would love to see this for lower tiers. This is great to know - but where are you getting the data? Is this from Blitz or PC WOT... now maybe PC WoT is basically the same but ideally I'd like it for Blitz. I have a mostly stock KV-1... and OMG is it a pig. I suspect the problem is resistance on soft(er) ground. What I really want to know is what is my next upgrade - suspension or engine? The one up engine just says it's heavier.... well that can't be right. I'm sure it helps with acceleration but I can't tell. The suspension indicates a small increase in traverse speed - but does it also help with Terrain Resistance? My big problem right now is mobility but with the information I have I can't tell what is going to help me - if at all. At this point I guess I should just dump my free XP and get everything I can. Edited by putnamJavi, 19 August 2014 - 08:02 PM. The engine and suspension don't really help much. The KV-1S is a whole different animal so just keep grinding. I have a mostly stock KV-1... and OMG is it a pig. I suspect the problem is resistance on soft(er) ground. What I really want to know is what is my next upgrade - suspension or engine? The one up engine just says it's heavier.... well that can't be right. I'm sure it helps with acceleration but I can't tell. Keep swiping for more stats. It won't help your speed or acceleration but it reduces the chance of fire. Anyway, the KV-1 will remain a bit of a pig, but it has to be. That tank is so OP in every other way, it would be a joke if it had speed as well. Just enjoy the grind, angle it right and you're nearly invincible. You should be able to easily carry tier 5 down games and even carry with higher tiers. Thanks - yes the top suspension did help my KV-1 quite a bit on softer ground. I haven't done the top engine yet - in game it only shows as a lower chance of fire. Do you know if the top engine has any other advantages such as acceleration, even though the HP is the same? As I said above, reduced chance of catching fire.